This week I closed my Korean movie season with a review of The Man from Nowhere and then posted trailers for Rurouni Kenshin and the latest Nanoha movie. Next week will see another Sion Sono Season complete with podcasts and reviews. More details on Monday. 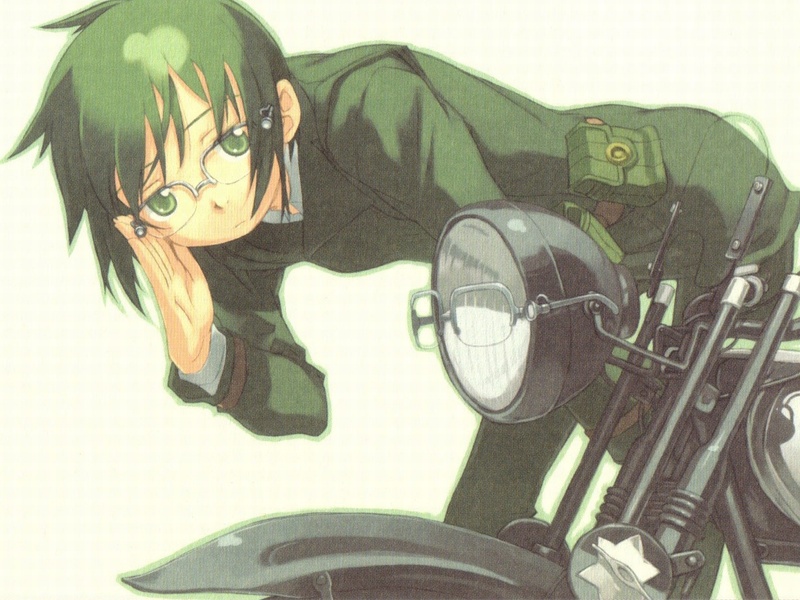 Oh, and the Kino no Tabi simulwatch has come to an end and I realised that the anime is even better than I remember. Cue picture. What’s does the Japanese movie box-office chart look like this week? The only change in the top five is last week’s newest entry sneaking in at five. Thermae Romae continues to hang in there for the ninth week in a row while the latest Berserk film enters at nine. 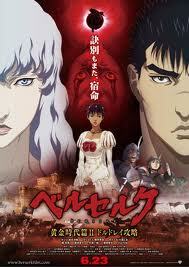 This Berserk film focusses on the epic battle to capture Doldrey castle and it is a pretty gripping part of the story. What’s released in Japan today? This indie feature, which has been doing the rounds on the international festival circuit since 2010, finally gets a Japanese theatrical release. Makoto (Murakami) is a Japanese teacher who lives with Shinji (Kanyama). When Shinji’s friend gets married, he starts to think maybe he should take the plunge. This does not impress Makoto who regards Shinji as naïve for wanting to get married because she thinks marriage changes nothing. But her feelings are about to change because she might be pregnant. I rarely comment on posters but I really dislike this one. I would avoid this film based on the poster alone. That would be a mistake because the plot actually sounds interesting. This is Taichi Suzuki’s debut and it appeared at this year’s Yubari International Fantastic Film Festival where it won three awards including the Special Jury Prize. It stars Hiroki Konno (Crows Zero), Haruka Nakagawa of the idol group AKB48, and Tomoko Ishii (Shall We Dance?). Daisuke Bamba (Konno) is thirty-two and wants to be a director but he has no idea about what he wants to shoot and he has a complex about his physical traits. Momoko Kinoshita (Tashiro) has always wanted to be an actress since she was a school student. Since then she has been an extra in movies. The two will meet on a film set and change the course of their lives. A movie adaptation of a Japanese murder mystery series inspired by Hideo Yokoyama’s novel series, Masaaki Uchino (Thirteen Assassins) takes the lead as a police coroner Yoshio Kuraishi. He is supported by many actors from the two Rinjo TV series Masanobu Takashima (Infection), Dai Watanabe (Crows Zero, Higanjima), and Yuki Matsushita (Beck). 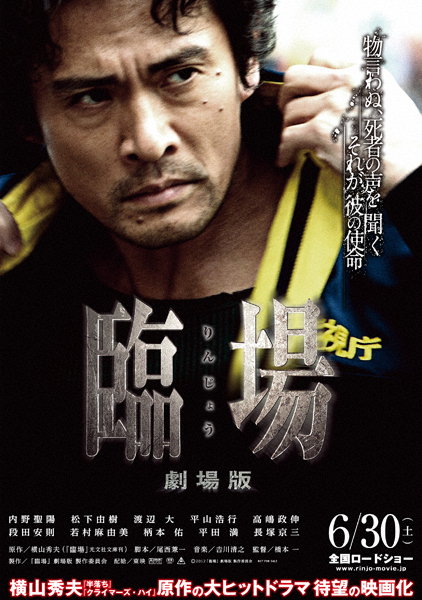 Yoshio Kuraishi (Uchino) is a police coroner who lost his wife to a crazed murderer. He sees his mission in life as finding justice for the dead and understanding their pain. In this film he has to investigate the closely spaced murders of a psychiatrist and a lawyer who helped a mass murderer (Emoto) escape the death penalty. Is it a case of a relative of a victim seeking revenge or something more? Warner Bros Japan strike again with another live-action adaptation of a classic manga! 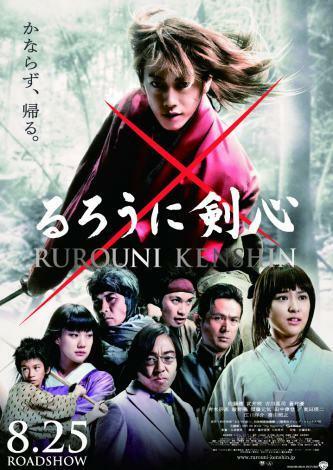 A trailer for the forthcoming live-action adaptation of Nobuhiro Watsuki’s classic chanbara manga Rurouni Kenshin has been released on Yahoo! Japan and it gives us a glimpse of what is on offer as well as letting us listen to the theme song “The Beginning” by the J-rock outfit ONE OK ROCK. The film stars Takeru Sato (BECK, Kamen Rider Den-O) as the titular samurai with Emi Takei (Ai to Makoto) portraying Kaoru. Support is provided by Yu Aoi (Memories of Matsuko, Honey and Clover), and Teruyuki Kagawa (Tokyo Sonata, Sukiyaki Western Django). The film is directed by Keishi Ōtomo who directed a popular NHK historical television series named Ryomaden which featured Sato. It is the early Meiji period in Japan, a time of rapid industrialisation and modernisation which will consign samurai to the history books. One such samurai is Kenshin Himura. He was once an elite swordsman known as “Battosai” before taking an oath not to kill. He now finds himself as a wandering samurai offering aid to those in need as atonement for his past actions. During his travels he meets Kaoru Kamiya, an instructor at her father’s Kendo school. She offers Kenshin a place to stay at her dojo and their relationship begins to blossom but Kenshin’s past will soon catch up with him as he discovers that somebody has been using the name “Battosai” while committing murders in Tokyo. Anime movie adaptations are making a big splash in the Japanese movie charts this year so here trailer for Magical Girl Lyrical Nanoha the Movie 2nd A which is now being streamed on the film’s official site ahead of the film’s premiere on the 14th of July. 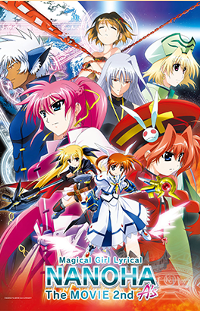 Magical Girl Lyrical Nanoha The MOVIE 2nd is a sequel to Magical Girl Lyrical Nanoha The MOVIE 1st which was released back in 2010 . While the first film was a retelling of the first series the sequel will be a retelling of the events of Magical Girl Lyrical Nanoha A’s but it will follow the magical girl Nanoha who has to face a new threat while revealing information regarding the Graham family. The staff members for the movie are veterans of the Nanoha franchise. The original creator of the Nanoha franchise, Masaki Tsuzuki, is writing the script. The director of the anime is Keizou Kusakawa (Campione!, Asura Crying, Dog Days) who has directed numerous entries in the franchise. Character design and animation direction is handled by Yasuhiro Okuda who has also worked on classic 90’s anime Record of Lodoss War. Art direction is supervised by Shinji Katahira who has also worked on Haibane Renmei. Also returning are the voice actors including Yukari Tamura (Remon Yamano in Ano Nattsu de Matteru), Nana Mizuki (Saya Kisaragi in Blood-C), and Kana Ueda (Rin Tohsaka in Fate/Zero). The anime will be released on the 14th of July. The Man from Nowhere is a film I picked after getting it confused with Nowhere to Hide directed by Lee Myung-se (Duelist). What I got was a formulaic but decent action film. Detective Kim Chi-gun’s (Kim Tae-hun) team are at the end of a two month stakeout of a nightclub where a drug deal is about to take place. That deal does not take place because a club dancer named Hyo-jeong (Kim Hyo-seo) steals the drugs. This is a major mistake because they are connected to a Chinese mafia organisation led by brothers Man-sik (Kim Hee-won) and Jong-suk (Kim Sung-oh). Hyo-jeong hides the drugs by placing them in a camera bag and taking the bag to a pawn shop owned by Cha Tae-sik (Won Bin), a mysterious man known only as “ajusshi (mister)”. He keeps to himself apart from his relationship with a young girl named So-mi (Kim Sae-ron), daughter of Hyo-jeong. So-mi regards Cha Tae-sik as a friend since kids make fun of her for being poor and her mother regards her as “garbage”. When the Chinese mafia come looking for their drugs they kidnap Hyo-jeong and So-mi to force Cha Tae-sik to hand over the goods. This is a bad idea because this mysterious man is far more dangerous than he seems and he sets off to rescue So-mi which means he will have to take out the gangsters while avoiding the police. One look at the story will tell you that original is the last thing this film is. Arguably the audience for this will not be bothered by the lack of originality as they are in this for the action and cool/amusing characters who do not need to be analysed too deeply and we get these elements in abundance all captured with crisp cinematography. 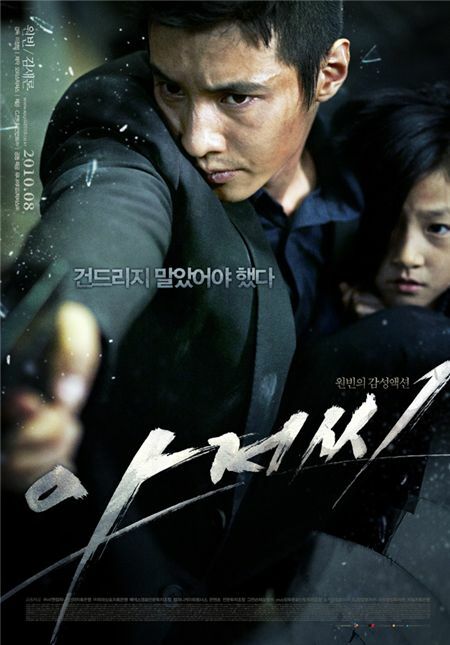 The film’s strongest point is the acting, particularly the interaction between So-mi (Kim Sae-ron) and Cha Tae-sik (Won Bin). Third Window Films is releasing Yuya Ishii’s “Mitsuko Delivers” on the 9th of July. 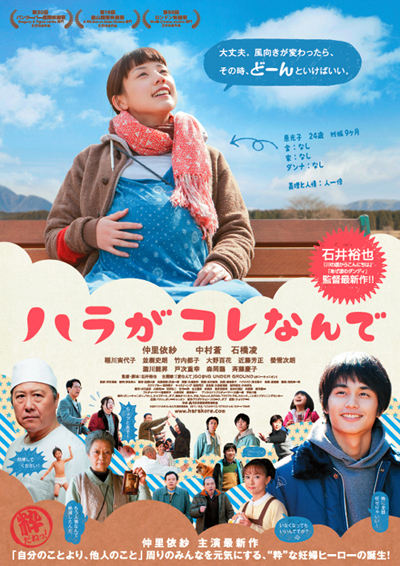 Mitsuko (Naka) is nine-months pregnant, broke and alone in Tokyo. Her parents (serial failed entrepeneurs) think that she’s in America with the baby’s GI father but she’s actually in dire straits as she is forced to move out of her apartment. Despite all of this she remains positive and believes that things will turn out alright. She doesn’t know where she will go but decides to hop into a taxi she cannot pay for and follows a cloud back to the ramshackle working-class alley where she grew up. This place is a relic from the past and it has had the life sucked out o it with the departure of many of its residents, but Mitsuko’s infectious get-up-and-go attitude soon compels the remaining locals to roll up their sleeves and restore the alley to its former glory. Mitsuko has so much to do and so little time before her baby arrives but she will find a new assertiveness and help those floundering around her. This week I wrote a number of reviews for a Korean movie season with A Bittersweet Life, Kick the Moon, and Duelist. As my reviews show I enjoyed them all and I highly recommend them. I watched my first modern Japanese TV drama in the form of the police mystery show Keizoku and indulged in an some insanely OTT (so offensive it turns into a parody) old school anime named Mad Bull 34 which has some of that brilliant Manga dubbing (back from when Manga was a UK company and went to town with dubs full of swearing and crazy but perfect accents). I picked up a Korean action-thriller named The Man from Nowhere and Takeshi Kitano’s Sonatine and I’m continuing the キノ　の　旅　(Kino’s Journey) simulwatch over at Anime UK News. 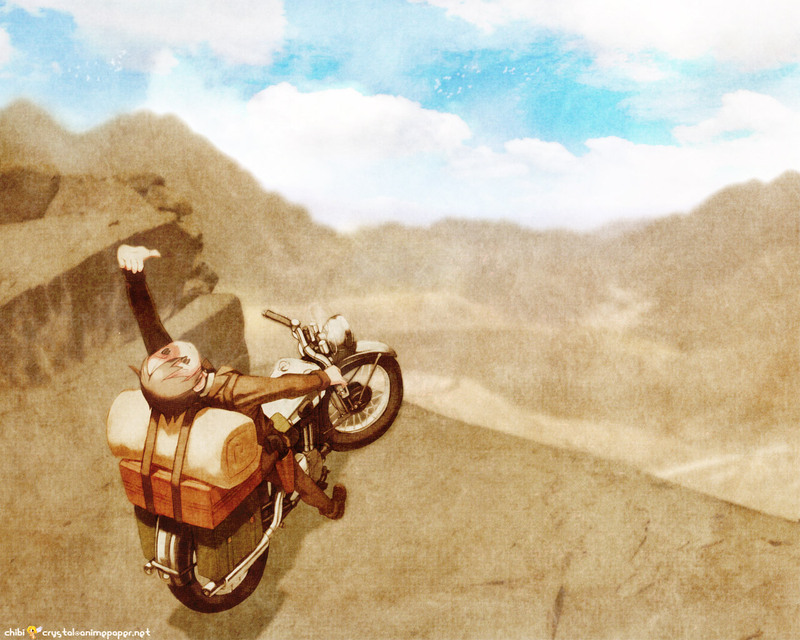 Cue picture of Kino and Hermes. What’s happening with the Japanese movie box-office chart this week? Of all the Japanese films released last week only Library Wars broke into the top ten while Snow White and the Huntsman snatches the top spot. This film is based on the Japanese TV show “Itinerant Dog Masao’s Trip” – full marks for using the word itinerant! – which featured a comedian named Matsumoto and his Labrador Masao. Director Otani has a long list of relationship dramas to his name including the adaptations of the Nana manga. SMAP’s Shingo Katori (Sukiyaki Western Django), Ryoko Hirosue (Departures), Riko Narumi (Crime or Punishment?!?) 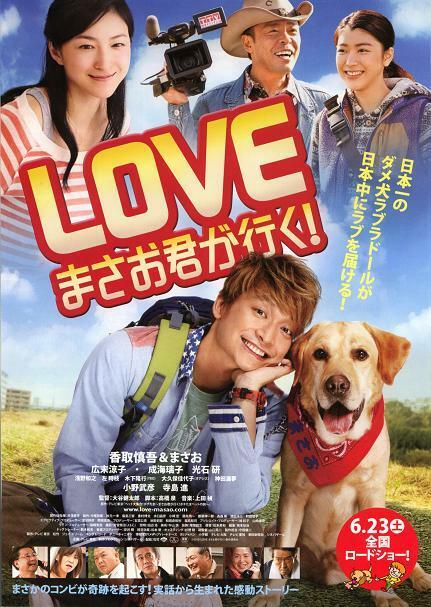 , Ken Mitsuishi (Himizu, Rent-a-Cat, Noriko’s Dinner Table) while Atsuko Maeda (AKB48) sings the movie’s theme song. Hideki Matsumoto (Katori) is a struggling comedian who is selected to star in a travel segment for an animal variety program on TV Tokyo. At first he is overjoyed at getting work even if he plays second fiddle to a Labrador Retriever named Masao-kun. Unfortunately Masao knows he is the boss and makes handling him difficult but things get even worse for Hideki when his girlfriend (Hirosue) leaves him. Down in the dumps but things change when Masao rushes to his aid after an accident and after that the two get along better than ever. Berserk Golden Age Arc II: The Battle for Doldrey is the second films from a trilogy of movies that has adapted The Golden Age Arc of Kentarō Miura’s original manga and animated by Studio 4°C. It is directed by Toshiyuki Kubooka who has worked as animation director on notable titles like Gankutsuou, Nadia: The Secret of Blue Water. Electronic artist Hirasawa Susumu (Paprika, Paranoia Agent) who created the distinctive music for the original TV anime adaptation created the main theme “Aria” for the movie while Shiro Sagisu is handling the rest of the soundtrack. The saga follows Guts a strong mercenary with a huge sword and little direction in life. All of that changes after he meets Griffith, leader of a group of mercenaries named Band of the Hawk who are working for the Kingdom of Midland. Guts decides to throw his lot in with them and finds himself developing a deep relationship with Griffith but also finds that Casca, a commander in the Band of the Hawk, is jealous that Griffith returns his feelings. The two find themselves swept along in Griffith’s rise to power. The second film will focus on a pivotal point in the war between Midland and Chuder as the Band of the Hawk launch an epic battle to seize Doldrey Castle, a place thought impregnable and home to an elite band of knights in the service of the Chuder Empire. Duelist marks my first experience of a Korean historical film. At first disorientating, once I surrendered to the film I found myself in an intoxicating dream. Korea under the late Joseon Dynasty is facing the threat of counterfeit money destabilising the economy. Detective Namsoon (Ha Ji-won) and her partner Detective Ahn (Ahn Sung-ki) are investigating the source of this problem but their investigation will reveal much more than standard criminality as they track down the source whilst duelling with a beautiful swordsman named Sad Eyes (Gang Dong-won) who is out to protect the counterfeiting operation. Namsoon will have to confront this mysterious man and the fact that with every duel they have, the two are falling increasingly in love with each other. The first twenty minutes of the film are packed with so many editing and directing tricks I was scared I would be tired of what was to follow. We witness a police surveillance operation in a market which turns into stylish chaos as sword fights erupt, a horse stampedes, and people chase each other. We are bombarded with a stop/start rhythm as the film cut between characters across the market and they are captured in slow motion, freeze frames, montage, and undercranking. 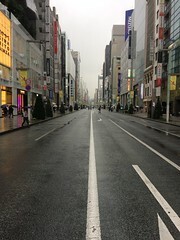 This reminded me of the sort of impressionistic moments that Wong Kar-Wai uses and once I made that connection I relaxed. 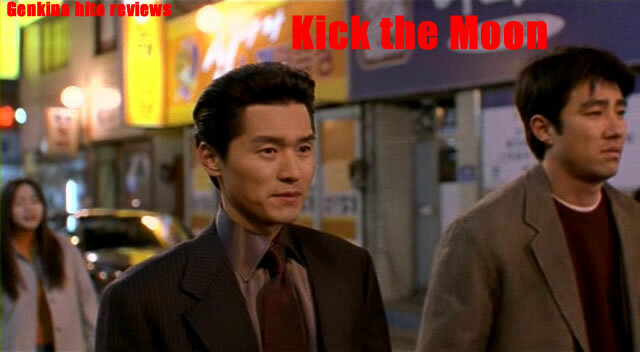 Kick the Moon is such an intriguing title and it must have meaning for South Korean’s but it’s lost in translation. In any case this is a very entertaining gangster comedy. Ten years ago a legendary fight took place between two rival schools in Gyeongju. Tough guy Choi Gi-dong marks his place in history by getting into the thick of the brawl while his friend, the shy and decent student Park Young-joon stays out of trouble which makes him a target for bullying for his fellow students. Ten years later the two have switched roles as Choi Gi-dong (Cha Seung-won) is a high school home-room teacher desperate to keep his kids out of trouble while Park Young-joon (Lee Sung-jae) is a major gangster operating out of Seoul. When Park Young-joon is sent to annex criminal operations (quite openly) in Geongju for his gang he runs into Choi Gi-dong and what starts off as a friendly reunion becomes testy when they reminisce about the fight. Their relationship sours even more when they both meet and fall for feisty and cute café owner Min Ju-ran (Kim Hye-su) who has a school-age brother, Min Jin-seob (Lee Jong-su), desperate to be a gangster. The two will find their friendship strained as they fight over Min Ju-ran amidst the chaos of a mob war. Kim Jee-Woon’s (The Quiet Family) filmography is packed with so many great titles made in such a short space of time it can only be explained by a Faustian pact or sheer brilliance and mastery of genre conventions. A Bittersweet Life is another masterpiece that plays with the conventions of the gangster film. 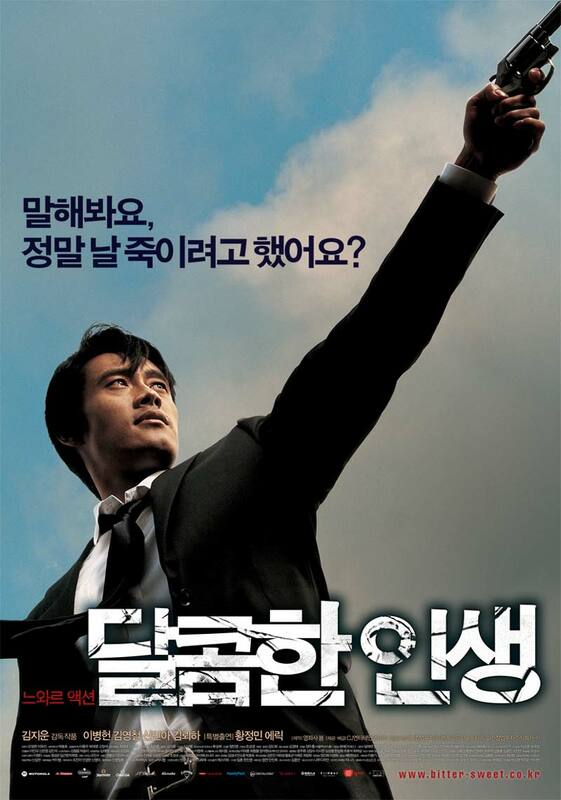 Sun-Woo (Byung-Hun) is a trusted enforcer who runs a restaurant/hotel for his boss Mr. Kang (Yeong-Cheol). The two are facing trouble from a new and sociopathic gangster named Baek (Jung-Min). Kang has other things on his mind such as his three day trip to Shanghai and the possibility that his young girlfriend Hee-Soo (Min-A) may be seeing a younger man. He sends Sun-Woo to watch over her. Sun-Woo is wary but goes ahead with the job. He was right to be wary because Hee-Soo and the world she inhabits charm Sun-Woo and open his eyes to the desolation of his life. This leads to his cool persona fragmenting under moments of weakness which will place him on the hit list of both his boss and Baek and leave Sun-Woo standing alone. Like the protagonists of neo-noir thrillers Drive and Le Samourai, Sun-Woo exists in a macho and nihilistic criminal underworld which demands a person subsumes their existence into their role/organisation and follow harsh rules. Similar to those films, when a girl enters the story the protagonist is forced to make a choice between adhering to those rules or being authentic to himself and breaking them to be with her. What A Bittersweet Life does brilliantly is to display Sun-Woo’s existential self-questioning of his place in the world. Sun-Woo is just one ego among many in his gang. What separates him is the degree of rigid self-control and awareness he possesses. Through these attributes he has cultivated the social-mask of reliable enforcer which has made him indispensable to his boss who treats him as a confidant. The 1st of July marks fifteen years since Hong Kong was returned to Chinese sovereignty and to commemorate that special occasion, the Hong Kong Economic Trade Office, London, and Terracotta Festival have teamed up to hold a film festival which will showcase the best of Hong Kong films past and present, and pay tribute to one of the most vibrant sources of films in the world. 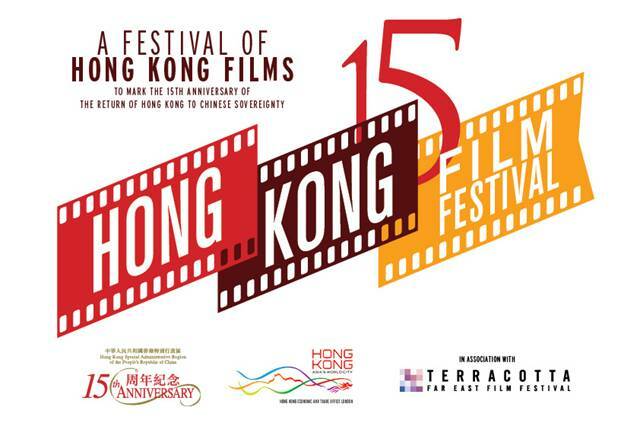 The ‘Hong Kong 15 Film Festival’ launches on the 2nd of July 2012 at the Odeon Covent Garden, London and it will run for a fortnight until 14th July. Fifteen films have been carefully selected and like the Terracotta Festival there will be guests attending. The diversity of Hong Kong cinema will be represented through a panorama of films divided in three sections: ‘Currents’, ’15 Years Review’ and ‘Shaw Brothers Classics’. The Festival will open with multi-award-winning drama, A Simple Life by acclaimed director Ann Hui, starring Hong Kong star Andy Lau and a comeback performance from the highly decorated Deanie Ip who won the Best Actress at the 68th Venice International Film Festival. The event will be attended by Roger Lee, the producer and writer whose life story the film is based on. Other highlights of the ‘Currents’ section include Life Without Principle by prolific filmmaker Johnnie To and The Bounty by Fung Chi Chiang.